Limited Edition, 1/4" Scale Dimensions, operational on 36" radius curves, Brass body construction, Offered in cab #2816, Authentic Paint Scheme, Constant voltage headlight, Constant voltage backup light, Front operating classification lights, Sprung drive wheels, Operational cab vents, fully detailed all weather cab, Firebox glow, Illuminated Cab, TA Studios fan driven smoke unit, Tender hatches open allowing access to volume control with sound on / sound off switch, Precision DC can motor, Flywheel coasting, Approximate Engine Dimensions: Length 23", Height 3 3/4", Width 2 1/2". 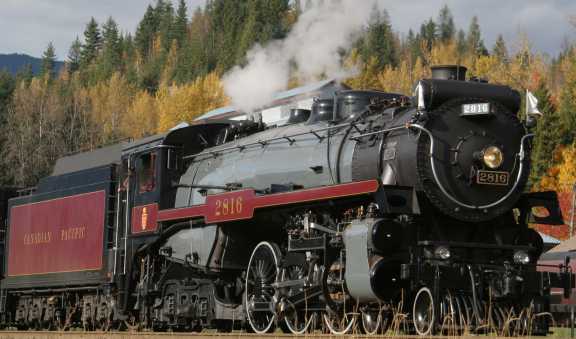 CPR's 2816 is a class H1b Hudson type locomotive built by Montreal Locomotive Works in December 1930. CPR Empress is now the only surviving H1b Hudson and is one of only a handful of preserved and operating CPR steam locomotives in North America. Available in two rail or three rail.